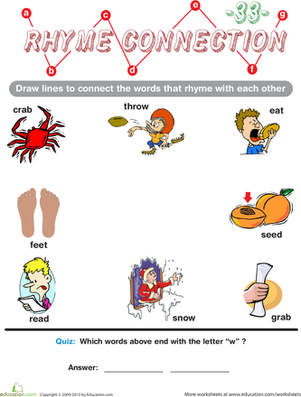 Students will be able to identify words that rhyme with red. Students will be able to identify various objects that are red. Tell your students that today they will be learning about the colour red. Ask your students if they can name any objects that are red. 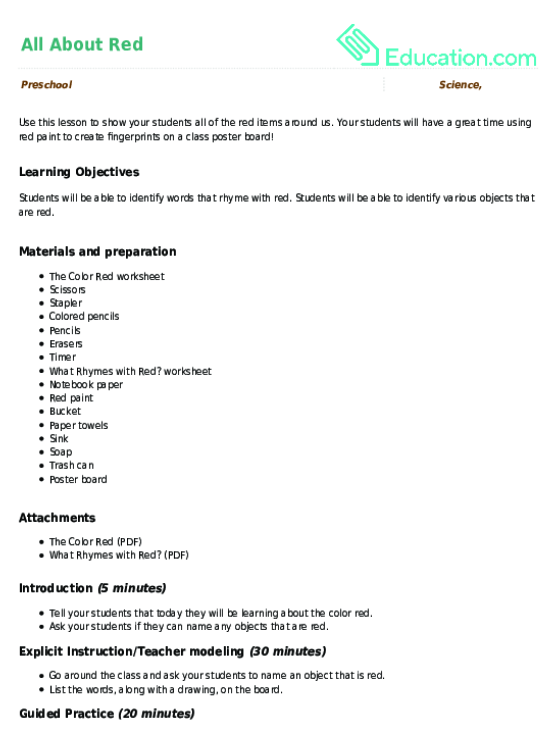 Go around the class and ask your students to name an object that is red. 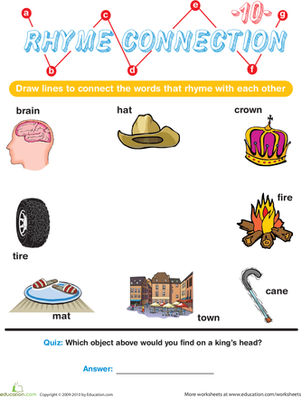 List the words, along with a drawing, on the board. 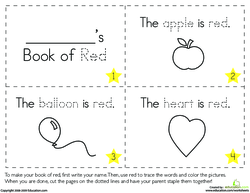 Ask your students to colour the pictures and trace the words on The colour Red worksheet. Set the timer to ten minutes. After the timer goes off, have your students cut the pictures along the dotted lines. Go around the class to staple the books together for your students. 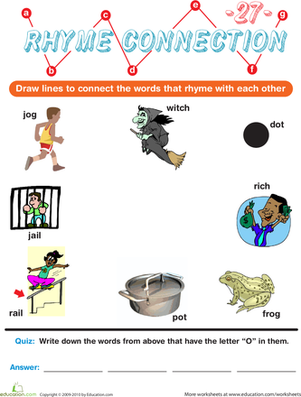 Ask your students to complete the What Rhymes With Red? worksheet. 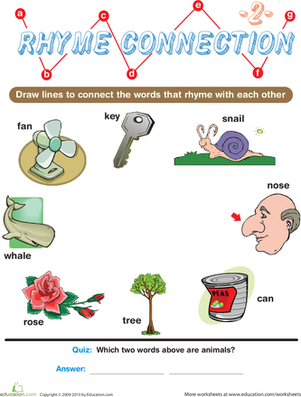 Ask your students to use the words and illustrations on the board to help them. Enrichment:Ask your students to write five sentences using the word "red." Support:Take your students around the class in a line. Have them point and touch red objects. Tell them the name of the object. Have them repeat it. 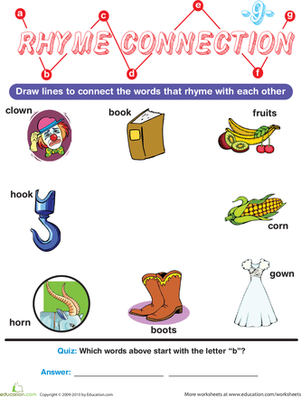 Ask your students to draw and write the names of any two objects that are red. Get a poster board and a bucket of red paint. Have the students come up one at a time and put their hands in the paint. After that, ask your students to put their hands on the poster board for five seconds. Ask each student to wash their hands with soap and water after putting their hand prints on the board. Ask your students to wipe their hands using paper towel. Use this lesson to show your students all of the red items around us. Your students will have a great time using red paint to create fingerprints on a class poster board! What does it mean to have zero? 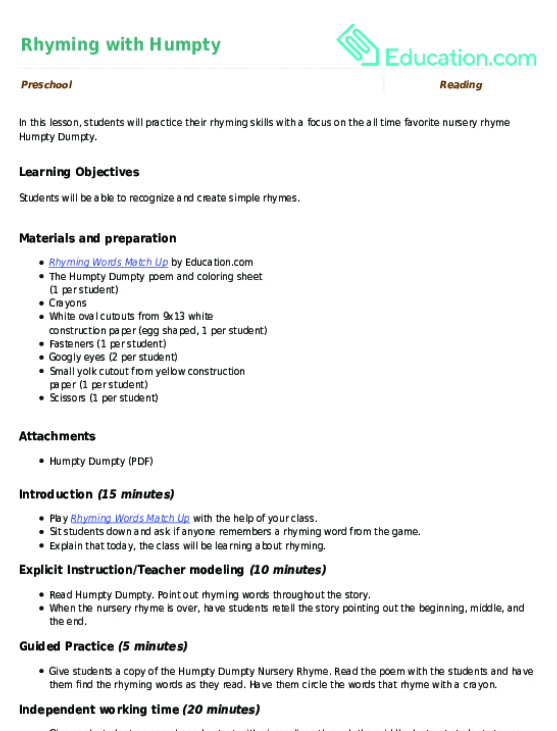 Teach your little fisherman an important maths concept with this nursery rhyme maths sheet. Try completing the maze passing all the words that rhyme and none of the words that don't rhyme. You need to pass by all the rhyming words without passing any words that don't rhyme. Help your child find all the rhymes that he should pass on his way through the maze.